A dynamic mix of factors could worsen the alreadydeteriorating military posture between the U.S. and North Korea as PresidentBarack Obama hosts South Korean President Lee Myung-bak at the White House thisweek. Two topics will dominate those talks, North Korea's holdingof two women journalists from the U. S. and its continuing missileactivity. The North Koreans maygreet this week's meeting with a barrage of short and long range ballisticmissile tests to make at least a virtual appearance at the same White Housegathering. One of those tests could mark a second effort to place aNorth Korean satellite into space, after a Taepodong 3 ballistic missiletest launch failed to do so in April. But now North Korea has more competition from SouthKorea. The South has just completed a new space center which willbe used to send a satellite into orbit from its own territory for the firsttime, as early as July 30. The South Korean Space Centre is in Goheung 300 miles southof Seoul. If the schedule holds, on July 30 the center will launch theSouth Korean KSLV-1 rocket, carrying a small engineering satellite. The launcher has a Russian built first stage derived fromKhrunichev's original Angara vehicle plans. South Korea has already launched 10 satellites usingoverseas launch sites and recently completed a deal with Mitsubishi HeavyIndustries for the launch of a large new imaging spacecraft on a Japanese H-2Aby 2011 to 2012. Kompsat-3 will carry an imaging system co-developed withEADS Astrium in Europe and the German Aerospace Agency. From an orbit of 670km, the pan sensor will have 700 mm resolution while its 4-band multispectralscanner will have 2.8 meter resolution. This will be a far more advanced spacecraft than North Koreacan even dream about. But with South Korean President due next week at the WhiteHouse, and the imminent launch of South Korea's first space booster, the Northappears to be "acting out" to stay the focus of world attention. Andthe activities are drawing the concern of the Pentagon and the Kremlin as wellas many other world governments. 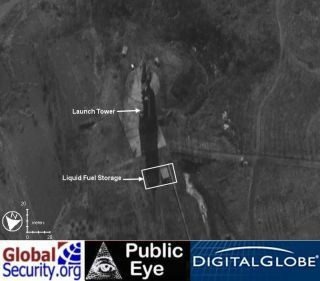 New facilities and test activity: North Korea isbeginning to reveal a significant increase in ballistic missile developmentcapability and ground test infrastructure. The U.S., Soviet Union and Chinawere all able to make rapid progress from early flight test mistakes and NorthKorea is even further up the learning curve. Missiles being transported around the country: Numerousmissile movements are evident around factories and areas like new launch sitesjust completing construction. One major new facility on the Yellow Sea willallows testing of long range missiles without overflying Japan. It also wouldallow polar orbit space missions, according to analyst Charles Vick of GlobalSecurity.Org. ICBM development: The third flight test of a long rangeTaepodong missile could be launched by July. It failed twice before but succeedin many key technical areas during its third test in April. It was flown thenas a three stage vehicle ostensibly to launch a satellite. It managed to fly towithin 1,000 miles of Hawaii, however. The North is likely to use the satelliteruse again. The main mission, like the one earlier this year, isexpected to go off North Korea's primary east coast launch site. But aTaepodong 2 shorter range version of the heavy booster may be lurking on theWest Coast Yellow Sea pad as well, evidence indicates. Several shorter range Nodong missiles are also expected tobe fired in tactical barrages between firings of the larger two missiles. More nuclear tests: Other highly sensitive test dataindicate that North Korea could conduct a third undergroundnuclear test by year's end. A key U.S. intelligence site monitoring that North Koreanthreat is the Air Force Technical Applications Center (AFTAC) a top secretfacility at Patrick AFB, Fla., adjacent to Cape Canaveral Air Force Station. It is a seismic data fusion center receiving seismic datafrom dozens of stations around the world to provide evidence of undergroundtests. It also helps analyze air samples and electronic intelligence related toatomic tests. Some of that data flows to AFTAC from aircraft like this AirForce RC135-U "Combat Sent" electronic surveillance aircraft stagedout of Japan. This flurry of North Korean ballistic missile movements keepsthe U.S., South Korea and Japan in an extended guessing game about what iscoming next. On a tactical level this is forcing the U.S., and its alliesto adjust intelligence operations on a near daily basis. On a strategic and tactical level it is forcing the combinedU.S. land, sea and air forces defending South Korea to update potential targetlists and lines of command and control. New strategic and tactical planning and expenditures areevident by all the allies. The Missile Defense Agency is reviewing the radarand missile tactics it could use for the next North Korean Test. One option is to shoot down any Taepodong overflying Japanas a demonstration of what U.S. and Japanese Aegis destroyers can already do. Japan is also accelerating plans for development ofballistic missile warning satellites that will be added to the multibilliondollar fleet of optical and radar imaging spacecraft launched by Japan afterthe first North Korean missile development surge in 1997. But that new spacecraft is several years away from firstflight. Until then Japan's own Aegis destroyers, assisted by the U.S. Navy, canhandle the job if a decision is made to shoot down a North Korean missile nearJapan or in the mid-Pacific Ocean. That tactic would demonstrate to North Korea that the U.S.and its allies are not going to allow the North to flout its treatyobligations.